This one-and-a-half-story pyramidal-roofed house features a gable centered on the façade and a projecting gabled bay on the right side. The house is three-bays wide and double pile with a hip-roofed addition across the rear. The hip-roofed front porch wraps around the right side of the house, terminating in the side gable. It is supported by round columns and retains its original railing. The house rests on a brick pier foundation and has pressed tin roof tiles and two interior corbelled brick chimneys. It retains original wood weatherboards and trim including boxed eaves, cornerboards, and a cornice return on the right gable. Windows are one-over-one replacement windows, though an original multi-light sash remains in the right gable end. The front door is a beveled-glass pane over a single panel. The house appears on the 1913 Sanborn map, but earliest known occupant is Robert L. Crumpacker (carpenter) in 1920. Crumpacker remained in the house through the 1940s and constructed the home next door (at 906 Burch) for his son, J. Patrick Crumpacker, in the late 1930s. Garage, c. 1937 – One-story, front-gabled, frame garage with hinged garage doors. The building is sheathed in wide wood weatherboards and has an asphalt-shingled roof. 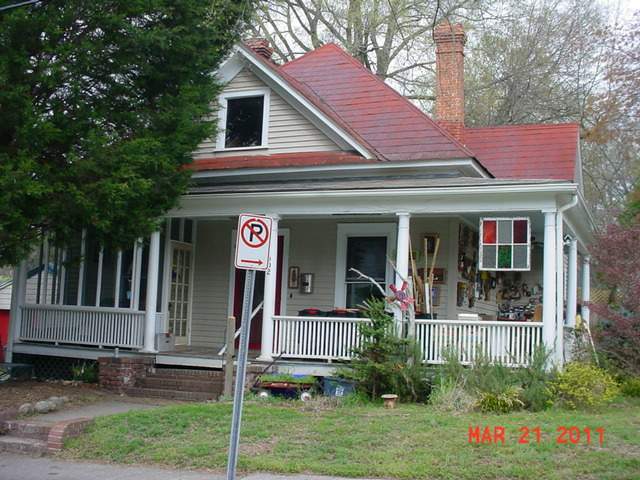 It was built concurrent with 906 Burch Avenue and was shared between 902 and 906 Burch until the large lot was split.